Hanuman Jayanti 2017: The Hanuman Jayanti 2017, Celebrated on the birth anniversary of the Hindu God Hanuman on 11th April 2017. The priests are maintaining that this special significance is occurring after 120 years and the next Maha Sanyog will be in 2021 and hence Hanuman Jayanti 2017 is of utmost importance. This year, devotees will be able to gain maximum blessings from Lord Hanuman with little penance.This unique confluence of the three entities will be seen after 120 years and that is why Hanuman Jayanti 2017 is more special. 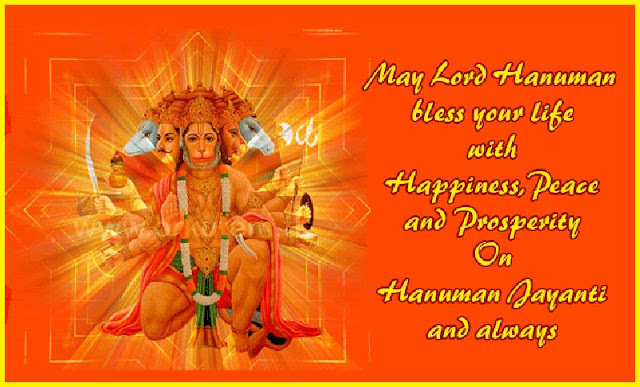 Each year, Hanuman Jayanti is celebrated on the full moon day during Chaitra month. Hanuman Jayanti is celebrated to commemorate the birth of Lord Hanuman – the Vanara God who played an important part in Ramayana and is a devotee of Lord Rama. Although there are more days that Hanuman Jayanti is followed during the year according to the beliefs and customs of different regions, Hanuman Jayanti during the Chaitra Purnima is the most significant one in north Indian states. Lord Hanuman, is considered as the greatest devotee of Lord Rama, according to Hindu belief. Lord Hanuman never married and he is a remarkable person in our religious history. Lord Hanuman is also known as “Bajrang Bali”. Lord Hanuman is also known for his power, strength, capability, sense of responsibility and deep devotion to Lord Ram. How Hanuman Jayanti 2017 Celebrated: On Hanuman Jayanti Devotees starting flocking the Hanuman temples since early in the morning to worship him. The devotees usually apply a tilaka of sindur from the Hanuman idol on their foreheads. As Hanuman was born at sunrise, the spiritual discourses in Hanuman temples start at dawn on this day. Later, prasad is distributed among the devotees. In a Siddhivinayak temple a lagu rudra abhishek is done in the morning followed by a pooja. This is done before 12 pm. Devotees sing and chant Hanuman Chalisa and devotionals in the temple.People believe that where ever people pray to Lord Ram with a pure heart or follow Rama’s righteous path, Lord Hanuman will always bless with prosperity and happiness. Purnima Tithi Ends = 11:37 on 11th April 2017. Here are the steps to perform Puja on Hanuman Jayanti. On Tuesday, April 11, go to a Hanuman Mandir or temple and read the Hanuman Chalisa and shlokas related to Lord Hanuman. Offer flowers and garland Lord Hanuman’s idol with roses. This is one of the easiest ways of appeasing the Lord. Light a Diya of ghee and pour mustard oil on the idol of Lord Hanuman and sing bhajans glorifying Lord Hanuman. If you are facing financial issues, then on Hanuman Jayanti 2017, you could offer 11 leaves of the Peepal tree (Sacred Fig tree leaves) to Lord Hanuman. Ensure that the words ‘Shree Ram’ are written on the leaves; Lord Hanuman being an ardent devotee of Lord Rama. Lord Hanuman is known as the biggest devotee of Lord Rama and his place is integral and important in Hindu mythology. He is also much loved by children as Pawan Sut and Hanuman.The Team Of IndianTalks Whishes Happy Hanuman Jayanti 2017 to all.